We’re at the Vale Sports Arena in Penarth for MTK Global’s debut Welsh show, featuring seven fights over the next two hours. The show has been hit by a trio of late hiccups, which has seen Liam Williams‘ opponent change. More significantly, Sean McGoldrick and Maredudd Thomas have had their appearances cancelled as their Nicaraguan opponents have been halted by immigration officials at Bristol Airport. Pontypridd’s Jermaine ‘The Problem’ Asare (9-3, 3KO) kicked off the show with a stunning first round knockout of Przemyslaw Binienda (2-21, 2KO). The 34-year-old Commonwealth Games bronze medallist, trained by Darren Wilson, took his time in the opening minute and eased his way in to proceedings – a wise decision given nine months of inactivity. Still, Asare’s more measured approach had worked out Binienda relatively early and when a countering right cross, left hook combination detonated, it levelled Binienda, who was flat on his back and unable to continue. Referee Reece Carter didn’t need to count to 10 to close the contest, which was the light-heavyweight’s first since he was stopped by Nathan Thorley for the Welsh title in December. Blackwood’s light-heavyweight Kody Davies (7-0, 3KO) needed less than two rounds to punish Jevgenijs Andrejevs (10-99-3, 4KO) and halt the usually durable visitor. It was one way traffic from the opening bell as Davies stalked his opponent from corner to corner, firing non-stop flurries to the head and body. Andrejevs complained to the referee almost as often as he threw punches and it was evident he was in too deep. For someone so active, Davies remained composed enough to pick his shots. They often landed around the sides of his opponent’s tight clam-like guard, which presented little target for the Welshman to aim for. Referee Chris Jones issued repeated warnings for Andrejevs to show him something and when he continued to wilt under Davies’ southpaw attacks, the official had little option but to wave the action off. 10 years ago, Andrejevs dropped future domestic and world champion Tony Bellew during a decision loss but the Latvian has now truly settled in to a journeyman role and came to Wales without a win in three years. The 24-year-old, trained by former world champion Gavin Rees, is now set to fight in Los Angeles, America at the end of September. It will be Davies’ stateside debut and eighth fight in less than 11 months, making him the most active current boxer in Wales. Cardiff’s super-welterweight Jamie ‘JJ’ Evans (7-0) extended his unbeaten streak with a controlled decision win over West Bromwich’s Dwain Grant (2-6-1), judged 40-37 in his favour. The southpaw was more eager than in his previous performances and repeatedly encouraged to be aggressive by trainer Darren Wilson. Still careful, Evans pressed forward from long range and set the distance with straight shots, a pattern that didn’t look like it would be disrupted. Grant was never able to really get to grips with Evans’ portsider stance. Instead, the 34-year-old sat on his back foot and tried to manoeuvre his own counter punches. Evans was often a step ahead in the tactical battle but Grant gave more resistance in the fourth and final round, earning a share on the scorecard of referee Martin Williams. The 22-year-old Welshman, cousin of Olympic silver medallist Fred Evans, won 10 Welsh titles as an amateur and is keen replicate the achievement in the professional code. Rhoose’s lightweight Lance Cooksey (7-0, 1KO) took less than a minute to dispense of Devon’s Jamie Speight (15-29, 2KO) and record his first early finish as a professional. The former Welsh amateur champion has made steady progress in the paid code and wasn’t in the mood to hang around, jumping all over Speight to force referee Chris Jones to intervene after 58 seconds. Cooksey raced on to the front foot and instantly had Speight in survival mode. The visitor was quickly tracked down with a couple of heavy backhands and soon stuck to the ropes. A frantic yet sustained two-fisted follow up attack was met with no resistance and a stunned Speight wasn’t given a chance to recover by Cooksey’s clinical instinct. 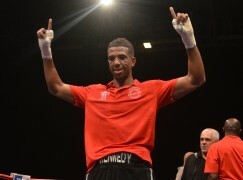 Cooksey won as recently as three weeks ago on a British Warriors show and the summer has been a successful period for the 28-year-old, who is well positioned to progress to more significant nights. Speight, a three time Southern Area champion in lower weight categories, is due to defend his belt against Ryan Wheeler in October, though that fight may now be in doubt. Blackwood’s super-featherweight Craig Evans (18-2-2, 3KO) returned to the ring with his new training team to outpoint Sunderland’s Jordan Ellison (10-17, 1KO) via a 60-55 margin. It was Evans’ first fight since an unsuccessful, though gallant, world title eliminator in February. Since then, the 28-year-old has changed his training team, leaving Tony Borg to join Gavin Rees. The southpaw counter-puncher opted for patience in the opener and took a good look at what Ellison was offering, despite having already dropped and decisioned the visitor in 2016. Evans let his hands go with more frequency in the second round and the former WBO European champion introduced three punch combinations, often ending them by edging away around the sides before Ellison could reply. The inside exchanges often descended in to clinches that referee Chris Jones had to separate but Evans’ medium and long range work were making a bigger impact in the third and fourth rounds. It provided a foundation for Evans to step in with hooks and he more blatantly attempted to dent Ellison’s constant and admirable enthusiasm in the fifth and sixth sessions. There was a peculiar interruption when Ellison’s glove split in the sixth round, resulting in a replacement being sought at ringside. Evans always had the first and last say in the exchanges but will know there was a lot left in the locker, which will surely be shown when he returns to title fights that hopefully come in the near future for one of Welsh boxing’s more established operators. Cardiff’s ‘Baby’ Jacob Robinson (3-0, 2KO) produced a scary fifth round knockout of Islington’s Jules Phillips (2-21) in his first fight under the MTK Global banner. The gulf in class was evident soon after the first bell when an instant mark was made by Robinson’s quick reflexes. He uncorked a crisp counter-right hook in the opening minute to take advantage of Phillips as he overreached and left his head too high, a worrying trend that continued throughout the contest. Evident that Phillips wasn’t prepared to exchange often, the Welshman was left with the unenviable task of tracking down his reluctant opponent in the second round. Robinson impressively stayed relaxed and almost made a breakthrough by the end of the session. After a quiet third round, Robinson feinted his way in to punching position with more success in the fourth round, triggering activity from Phillips who began to leave gaping openings. A straight southpaw left was fired down the pipe and quickly followed up by a right hook, it clearly staggered Phillips and a more significant ending awaited him. Robinson finished matters soon after with the same combination in the fifth round. It will be considered for Welsh boxing’s knockout of the year, though still made for uncomfortable viewing. Phillips fell face first to the canvas and with his eyes closed, which caused concern inside the arena. After receiving instant treatment from the doctors, he vomited in the corner and left the ring on a stretcher 10 minutes later to visit hospital. 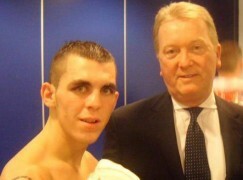 BoxingWales.com wish Jules Phillips a speedy and full recovery. 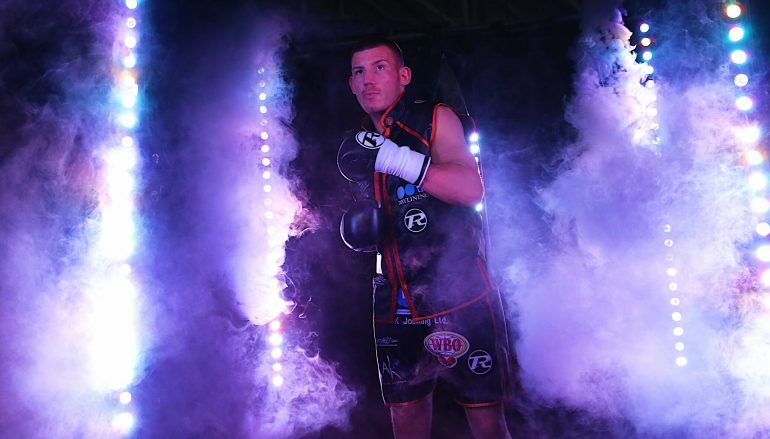 It was Robinson’s first six rounder and maiden outing under the MTK Global banner having signed a management deal with the company a month ago – a move which signalled the outfits intention to expand in to Welsh boxing. 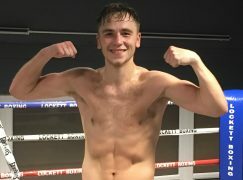 The 24-year-old is keen to follow in the foot steps of his father and win the Welsh featherweight title – the first belt Steve Robinson owned, later adding European and a WBO world title to the extensive family trophy cabinet. Clydach Vale’s Liam ‘The Machine’ Williams (18-2-1, 13KO) returned to the ring with a new look team to face Gateshead’s Craig Nicholson (4-3-1), knocking him out in the second round. Having cautiously warmed up in the first round, Williams slapped his hands together and applied more direct pressure in the next stanza. Somehow, he sent Nicholson over the top rope, snapping it in the process and leading to a five minute break for it to be fixed. When the action recommenced, it was soon over. Williams was back on the hunt, bloodying Nicholson with a spiteful left hook. A moment later, the same shot was delivered to the body and left the visitor on the floor and withering in pain, unable to beat the 10 count of referee Reece Carter. Headlining the New Beginnings show, it’s Williams’ first outing under the banner of the MTK Global management company and with new Sheffield-based trainer, Dominic Ingle, who appeared pleased with his charge’s start to the new chapter. For the second fight in a row, Williams’ opponent opted not to board the plane and he was instead left with another late placement, which was hastily arranged on a day’s notice. For that reason, Williams was forced to box at light-heavyweight, three weight categories above his natural division. 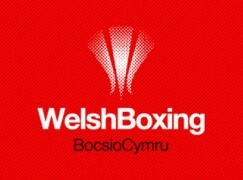 The Welshman weighed 12st 2lbs, whilst Nicholson was a pound heavier at 12st 7lbs. There are plans in place for Williams to face Liverpool’s undefeated James Metcalfe (18-0, 10KO). There are hopes for the to be held by the end of 2018 and the Scouser’s WBC International super-weltwerweight belt should be on the line.